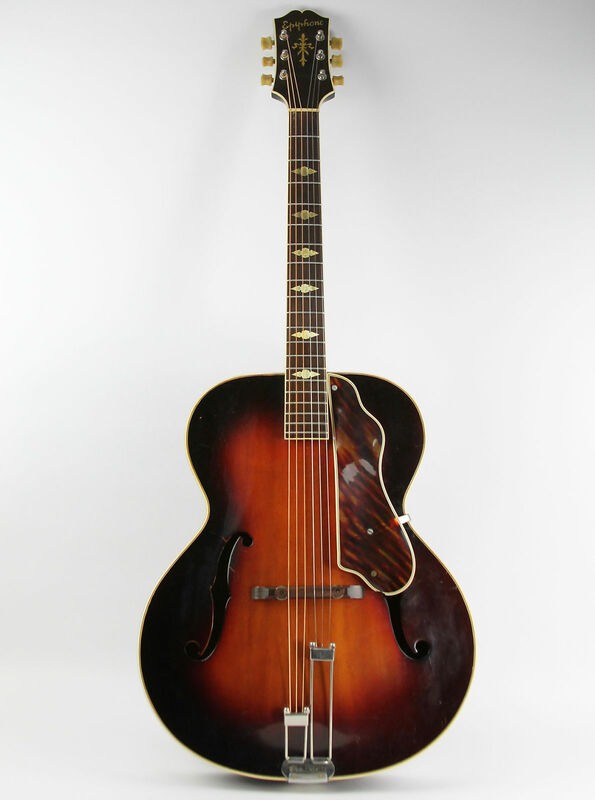 1945 Epiphone Triumph. End of the golden age of Epiphone archtops. Epi died in 1943 and his brothers proceeded to tear the company apart. Quality plummeted by the late 1940s. Warped guard. Ditch it. Get a repro or leave it off. This is a carved spruce top. 17" bout. Seller says slight separation in the center seam in the top. You might want to ask for better pics of the issue. There are already holes drilled on the bass side of the neck at the 14th fret, suggesting a floating bracket pickup. Mine is a 1943 with a repaired crack in the top at the f-hole (very common). Not as clean. I love it. $1799 with an offer option seems a great price to me. 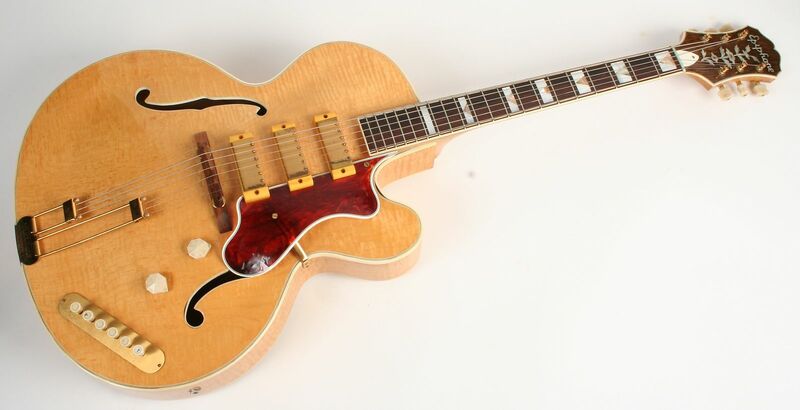 If you are looking for a vintage 17" archtop, you will be hard pressed to find a better deal. Epi died in 1943 and his brothers proceeded to tear the company apart. Quality plummeted by the late 1940s. Late 40's? I'd take a '53 Zephyr Emperor Regent over anything thta came before it. I'm sure the binding issue shown isn't the only one. Binding shrinks and pulls. But these generally don't have rot. And the right luthier can stablize it gently. Mine did. I got an even better price on mine. But this seems like it's in even better condition. And mine doesn't have the original tuners. This one seems to have the original keystones. Epis are different from their cousin Gibsons. But not lesser. Especially these earlier 40s editions. And they cost significantly less. Great necks. Mine has the very slightest V, much closer to a D with just a hint of a bump. When I want it to anchor my thumb I can feel it. When I don't, I don't feel it at all. And they look fantastic as well. Jaw droppers. With tons of soul. You just gotta' love that wonderful woody tone from a carved spruce top and a full depth body.